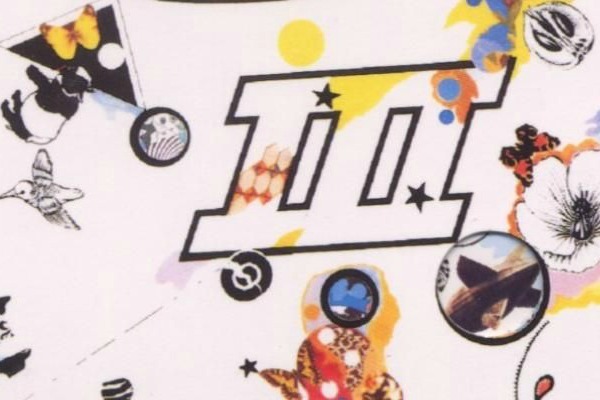 The #1 Albums: "Led Zeppelin III"
Detail from the cover of “Led Zeppelin III.” Cover artist Zacron (born Richard Drew) died last fall. On October 24, 1970, Led Zeppelin III blased onto the Billboard 200 album chart at #3. The next week, it knocked Santana’s Abraxas from the #1 spot and remained there four weeks, before Abraxas returned to the top. The album charted for 42 weeks, and to date has sold something like six million copies in the United States alone. —The album was written at Bron-Yr-Aur cottage in Wales and recorded at three different studios in England, but it was mixed at Ardent Studios in Memphis while the band was touring the States. —Some critics, not being complimentary, considered the album a response to the popularity of Crosby Stills Nash and Young. Jimmy Page pointed out that the band’s two previous albums had included acoustic tunes as well. —A full-page ad in the British music press appeared before the album’s release saying, “Thank you for making us the world’s number-one band.” This might have come as news to the Beatles (even accounting for their recent breakup) or the Rolling Stones, but perhaps it was just early. Led Zeppelin was one year removed from their landmark fourth album, which would become one of the most famous records of all time. It will not appear in this feature, however, because it stalled at #2. —“Immigrant Song” was inspired by a trip to play a show in Iceland. And it would inspire one of the web’s earliest viral videos, the fabulous Viking Kittens. In our next installment: another Beatle finds the life of a solo artist quite agreeable.